I don’t think it’s any coincidence that our friend Grace was born on April Fool’s Day. But putting the Lei’d jokes aside (for a moment), she is lucky enough to be on her way to warm Hawaii for a week of sun, fun, tall drinks, cool waves and hot lava (well, hopefully not hot lava). To celebrate her birthday and her trip, we asked our Senior Staff Madtini Intoxicologist to work late on Friday creating an original drink from scratch. He refused, so it was up to our new weekend intern Muffy to come up with something special. 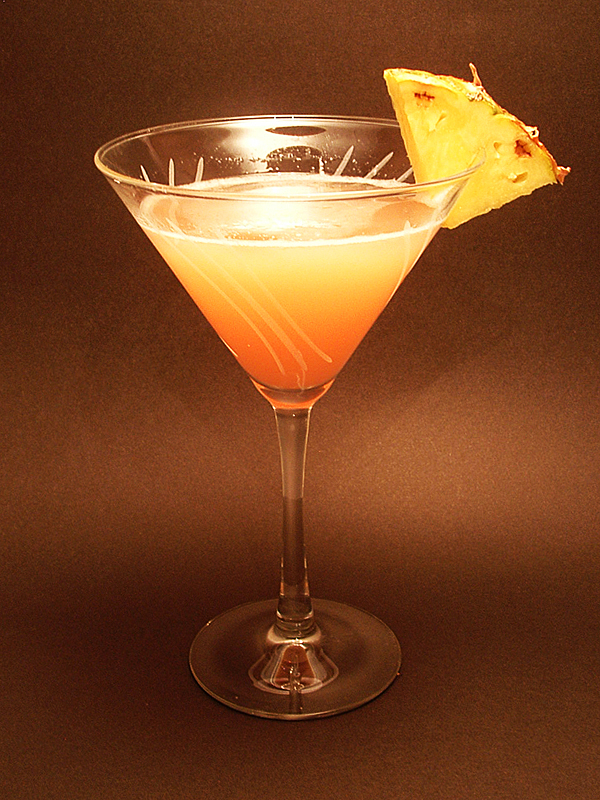 She managed to find a great drink recipe and mix up an Hawaiian Martini featuring pineapple and cranberry juice and just enough vodka to make us forget we’re still here in Toronto. Hauʻoli lā hānau Grace! (means Happy Birthday, we looked it up on the interweb) If you see any Kona Gold Coffee Liqueur during your trip you know what to do. Combine the ingredients in a cocktail shaker with several ice cubes. Shake gently and strain into a chilled cocktail glass. Serve with a wedge of pineapple.